Director – John Lasseter, Co-Director – Andrew Stanton, Screenplay – Andrew Stanton, Don McEnery & Bob Shaw, Story – John Lasseter, Andrew Stanton & Joe Ranft, Producers – Darla K. Anderson & Kevin Reher, Photography – Sharon Calahan, Music – Randy Newman, Animation Supervisors – Glenn McQueen & Rich Quade, Production Design – William Cone. Production Company – Pixar Animation/Disney. The idealistic young ant Flik is an inventor. However, one of his inventions goes awry and destroys the food sacrifice that the nest must make to the grasshoppers that intimidate them. Flik is disgraced as a result. Undaunted, he sets forth out into the world, determined to find a way to save the nest from the grasshopper’s imminent wrath. He comes upon an insect circus troupe. Mistaking them for warriors, he recruits them to come back and fight the grasshoppers. However, the circus performers prove less heroic than Flik imagines. Slowly though, the circus troupe come to realise that the ants are worth standing up to fight for. 1998 may well go down as a year filled with a remarkable number of coincidences of theme in filmmaking. The year featured two meteor collision films – Deep Impact (1998) and Armageddon (1998); two trapped-in-tv-become-reality films – Pleasantville (1998) and The Truman Show (1998); two giant monster movie remakes – Godzilla (1998) and Mighty Joe Young (1998); two vampire hunter films Blade (1998) and Vampires (1998); a host of life after death films – City of Angels (1998), Meet Joe Black (1998), What Dreams May Come (1998) … and two computer-animated films about the lives of ants. This latter coincidence was a competition between A Bug’s Life from Pixar and Disney and DreamWorks’ Antz (1998). It ended up being a race as to which would end up being released first – a race that ended up being won by Antz by six weeks. 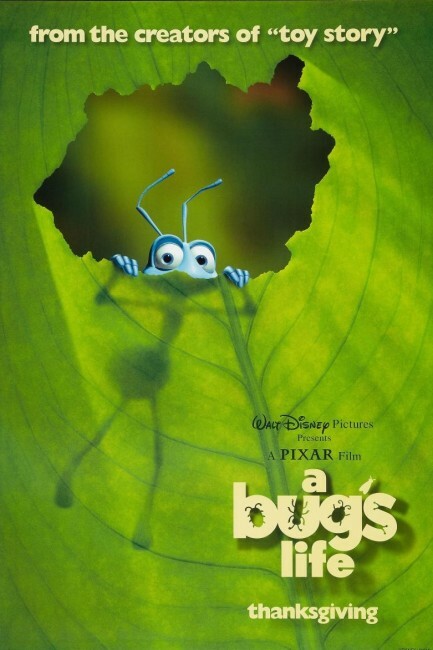 There are a remarkable number of similarities between both A Bug’s Life and Antz – both are centred around life in an ants nest that is under threat from a militant general; both feature an idealistic and individualistic underdog hero striking it out into the uncharted territories of the big, wild world; both feature the hero falling in love with a princess who remains above his station. Both films also have a uniquely similar sense of humour when it comes to the hero’s discovery of the larger (human) world – the fabled Insectopia in Antz and the great insect Metropolis here. The Metropolis here amusingly proves to be a caravan in the wilderness where moths try to prevent others becoming spellbound by the lantern and insect derelicts sit on the sidewalk holding signs “A Kid Pulled My Wings Off”. In insect bars, ticks order “Bloody Mary O+” and waiters call out orders “Okay, who ordered the dung?” (A Bug’s Life has a decidedly eccentric sense of humour – the end credits feature a series of animated ‘out-takes’, deliberately spoofing films that place bloopers over the end credits, something that became an ongoing joke through subsequent Pixar films). Of the two films, Antz is the better. There is more to its story of an innocent making his way in a larger incomprehensible human world. A Bug’s Life starts out in the same direction but abandons it whereupon the story becomes a rehash of The Seven Samurai (1954)/The Magnificent Seven (1960). The film has sufficient sense of humour to send up expectations – like having the insect mercenaries turn out to be a troupe of actors the hero has mistaken for great warriors. Nevertheless, the story falls into familiar patterns – Antz had far more in its sense of wonder, slowly opening up the world that is familiar to us through an ant’s eyes. The animation is excellent, better than the otherwise sterling work in Antz – the grasshopper general comes lip-synched for example. Overall though, A Bug’s Life is one of Pixar’s lesser films. A Bug’s Life was the second film from Pixar. The other Pixar films are:- Toy Story (1995), Monsters, Inc. (2001), Finding Nemo (2003), The Incredibles (2004), Cars (2006), Ratatouille (2007), Wall-E (2008), Up (2009), Brave (2012), The Good Dinosaur (2015), Inside Out (2015) and Coco (2017), as well as sequels to many of these. (No. 3 on the SF, Horror & Fantasy Box-Office Top 10 of 1998 list).